ECDPM’s Anna Knoll’s article ‘The security-development trade-off needs urgent rebalance‘ is featured in Friends of Europe’s ‘Global Flows Migration and Security’. Migration is top of the global agenda – and for many politicians, policymakers and people, migration and security are closely interlinked. The discussion on migration and security is complex and multi-faceted. It is also often based on misleading information, unjustified fears and coloured by clichés and prejudices. Far-Right populists in Europe are feeding an already anxious public with a toxic narrative linking migration to terrorism. The conversation is very similar in the United States. An EU which is open to migration will inevitably be insecure and unsafe, according to the often hysterical views being peddled by European populists. In the race for votes, mainstream politicians often embrace the populists’ message, thereby amplifying public concerns about migration. In response, the EU has expended much time, energy and money on trying to stem migration and refugee flows. Border controls have been enhanced, maritime surveillance upgraded, attempts made to combat smuggling networks and agreements have been struck with Turkey and Libya to stop the illegal entry of migrants into Europe. Repatriation agreements signed with foreign countries allow for the quick return of illegal migrants to their countries of origin. Lost in the often corrosive global debate on migration and security are some overarching truths: people have been on the move since time began and will continue to seek new horizons; Europe needs migrants to meet labour and skills shortages and to tackle the challenges posed by an ageing and shrinking population; security concerns linked to wars and conflict as well as climate change will continue 9 to prompt migrants and refugees to seek shelter in Europe and in other “safe” countries; the expected demographic increase in Africa will also mean a rise in the number of migrants coming to Europe. The priority in Europe and elsewhere must therefore be on ensuring a better management of migration flows and to prepare the public for the continued arrival of – and the need for – migrants. This demands the introduction of legal and safe pathways for the entry of migrants, better and more flexible trade and aid policies for the development of Africa and improved international coordination on issues linked to migration. Across the globe, countries will need to develop a new, more heroic migration narrative in which diversity is lauded and living together is not only viewed as necessary, but also embraced. This discussion paper takes a look at some of the key challenges facing global policymakers as they seek to craft a modern-day migration policy which meets some of the most compelling security concerns while also tackling many countries’ longer-term need for migrants. Our many contributors offer their views and suggestions for a more realistic and credible worldwide migration policy, their thoughts on the migration-security link and their experiences in different parts of the world. These views are presented in the paper’s three sections and highlight European efforts at tackling migration, on-the-ground realities around the world and cross-cutting dimensions of migration and security. 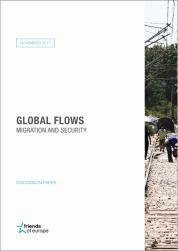 The topics and views presented in this publication are by no means exhaustive, but serve to present a snapshot of the global migration-security nexus. At a time when the story of migration remains a toxic one, these viewpoints help to debunk key myths and misperceptions and make a constructive and stimulating contribution to the ongoing conversation on migration and security.